EBMCPA, Inc. | Earl Benedict Macasaet, CPA Inc.
Earl Benedict Macasaet, C.P.A., Inc.
Earl Benedict Macasaet started his career in public accounting in 1989 and became a Certified Public Accountant licensed in the state of California in 1993. 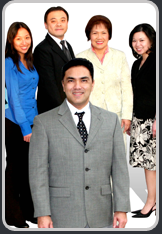 Earl Benedict Macasaet CPA, Inc. was founded in 1994 with an office located in San Dimas, California. It now services clients in various counties and states and includes individuals as well as businesses of all sizes and structures. Along with traditional accounting and tax services, EBMCPA, INC. takes pride in providing services specially tailored to each client’s needs. Its team of dedicated professionals are constantly expanding the scope of services offered to accommodate the changing needs and concerns of all its clients. As a client of Earl Benedict Macasaet CPA, Inc. you will be provided with the year round personalized service and quality of work that has led to their exceptional reputation. EBMCPA, INC. welcomes the opportunity to discuss your business and financial objectives to see how we can best assist you in your quest for business and personal success. Whatever service or services you may need, we know you expect excellence, and EBMCPA, INC. is committed to delivering it.